How can we help you to recruit more Franchisees at no cost to you ? By increasing the support that you offer to your Franchisees, over and above the services you provide for your business model. The success of your franchisees is vital to your recruitment process and this is where we can help…. Many franchisees are venturing into running a small business for the very first time and are totally unaware of the potential pitfalls that await them. To ensure that they run their business fully compliant to all of the Legislation and Regulation that affects them. They most certainly will not be experts in Employment Law – Health & Safety – Environment – Taxation – Licensing to name just a few. With nearly 40 year experience of guiding and supporting thousands of businesses….. we are, and can advise them 24/7 on all of these issues and back up this advice with an inclusive Legal & Professional Fees insurance cover to protect them against unexpected costs that could cause them sleepless nights and cripple their business. What business can afford paying from a few hundred pounds to tens of thousands of pounds in fines, penalties and awards?…Particularly when it can be so easily be avoided. By providing the security and comfort that we can partner with you to provide, at very low cost, your franchisees know that they can face any situation that arises by having unrivaled support for their business. One franchisor commented “Since providing your services to our franchisees, we have had reports from several, applauding the clarity, empathy and professionalism they have received from the service”. “This has definitely impacted in the overall satisfaction of our licensees and improved our ‘take up’ rate”. “We add the small fee to our licensing and management fees, so to us, it is no cost”. 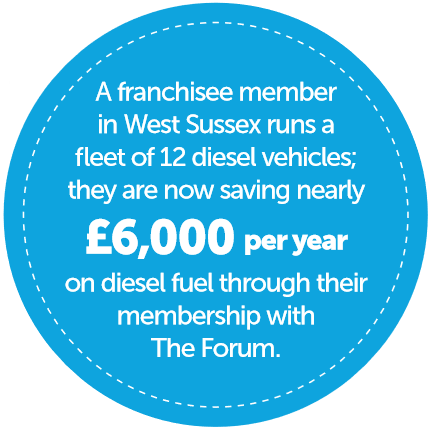 One Sussex based franchisee commented “I have utilised the service to help me reduce the running costs in my business”. “Aside from being able to cancel expensive separate insurance policies covering employment, taxation, environmental damage cover and health and safety, I have also used the cost reduction services to save money in areas of expenditure”. “This amounts to savings of nearly £6000 per year”. “I also had terrific assistance in setting up our staff pension arrangements”. This service and protection can be provided for as little as less than 48p per day per franchisee (based upon a sole trader sole operator business). To find out more, open the attachment below or call 01565 626001 to talk to one of our advisors.